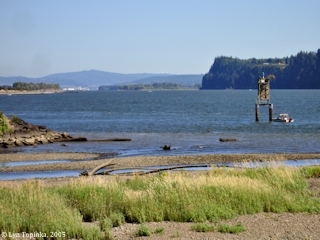 Green Point is located on the upstream side of Mayger, Oregon, at Columbia River Mile (RM) 58. 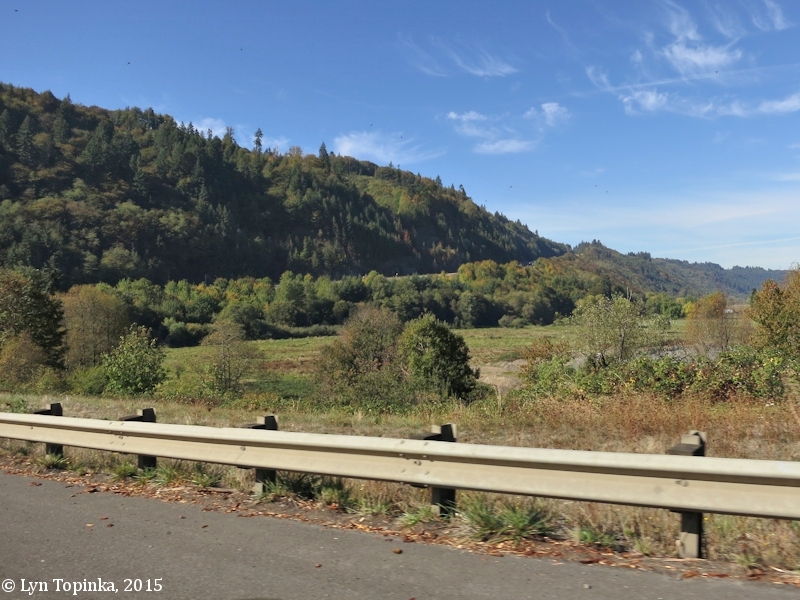 The point lies upstream of the old fishing station at Mayger, and downstream of a large impressive basalt cliff which lies between Rainier, Oregon and Mayger. Across the river lies Willow Grove and Fisher Island, Washington. 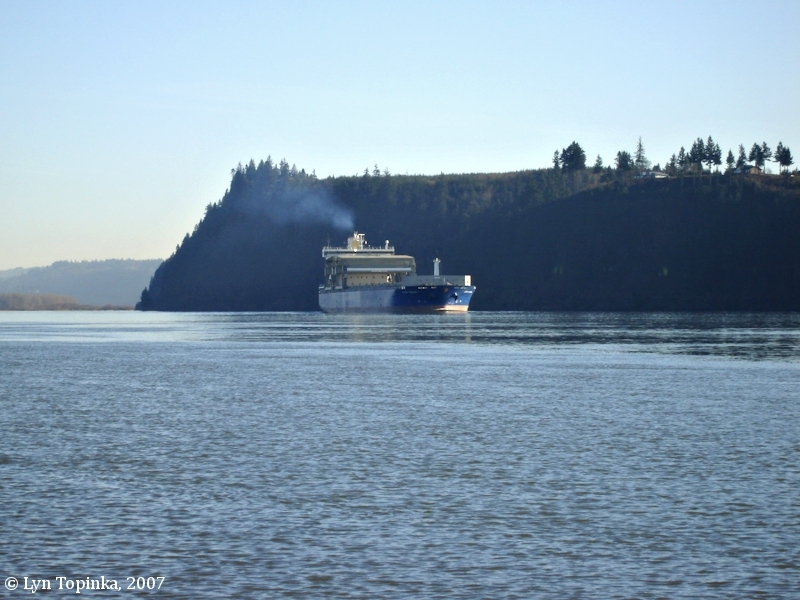 As located on topographic maps, Green Point is the westernmost tip of that cliff, the first part of the cliff explorers would see journeying up the Columbia. Lewis and Clark pass this area on November 6, 1805, and refer to the "high clift of Black rockd on the Lard. Side". 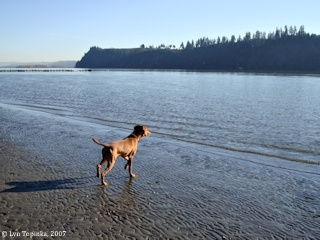 On their return they camp at Walker Island, at the base of the cliffs on the east of Green Point. 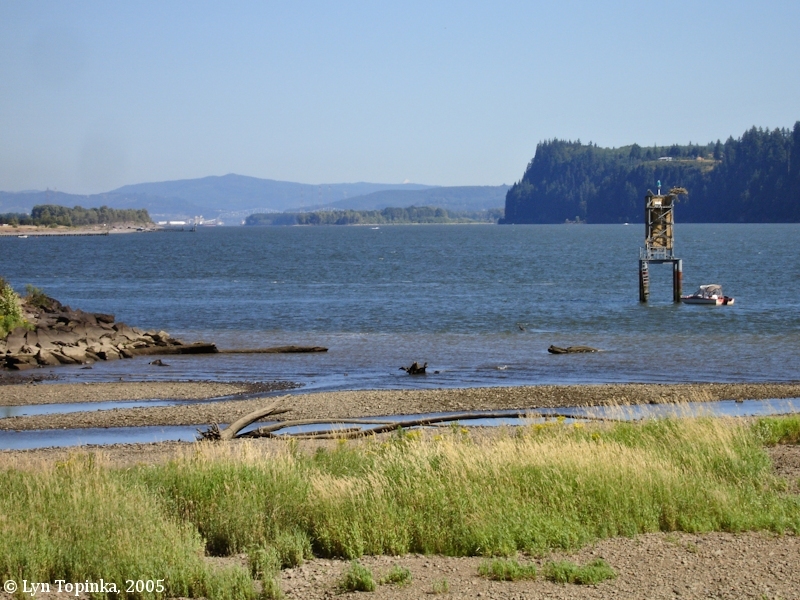 Lewis and Clark passed the Green Point area on November 6, 1805, after setting out from their camp near Prescott Beach, Oregon and heading west. The "long narrow Island" is today's Cottonwood Island and the "two Creeks" are presumably the Cowlitz River and Coal Creek Slough. The two islands "opposit a high clift of Black rockd on the Lard. Side" would be in the same location as today's Walker Island and Lord Island, white the "high clift of Black rockd on the Lard. Side" is Green Point. In 1792 Lieutenant Broughton of the British Captain George Vancouver expedition, camped at Green Point on October 26th. They called the point "Point Sheriff" after John Sheriff, master's mate of Broughton's brig the Chatham. 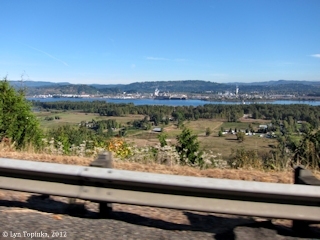 Lewis and Clark pass this area on November 6, 1805, after setting out from their camp near Prescott Beach, Oregon. On their return they passed by Green Point on March 26, 1806, and then camped at the foot of the Point on Walker Island. In 1841 Charles Wilkes of the U.S. Exploring Expedition called the high bluff "Waldron's Bluff". Fisher Island was called "Plumondon Island". "... Five miles above the turn the prairie terminates, where a high basaltic bluff rises, which I named Waldron's Bluff; it is 3 miles in length, and rises 800 feet above the river. ... 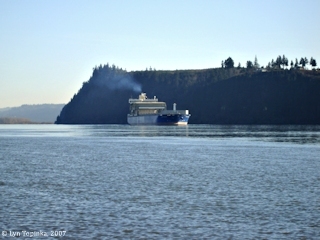 When Plumondon Island, which lies opposite to Waldron's Bluff, opens, steer for it. ... Opposite to the upper part of Waldron's Bluff lies Walker's Island, one-third of a mile from the shore ..."
The U.S. Bureau of Land Management's General Land Office Records (GLO) database shows a Harriet Green and William Heirs of Green being being granted title to 103.9 acres on December 1, 1871, for parts of T8N R3W, Section 19 (1820 "Sale-Cash Entry"). The 1888 U.S. Coast and Geodetic Survey's Chart "Columbia River Sheet No.4, Grim's Island to Kalama" has the point labeled "Green Pt.". 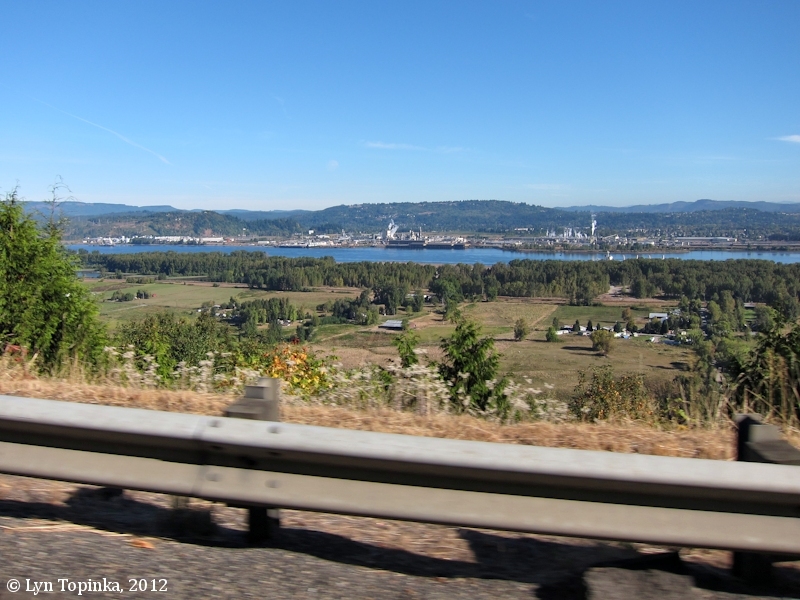 "... From the winding curves of RAINIER HILL (671 alt.) 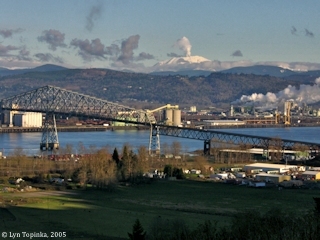 there is a fine view of Longview, Washington, and the narrow roadway of the bridge spanning the river, hundreds of feet below. The summit is reached at 50.6 m. Descending, the highway crosses ubiquitous BEAVER CREEK, 51.4 m. Within the next 15 miles westward the road spans the stream a dozen times. The country now presents wide expanses of logged off land. At 61.7 m. is a junction with a gravel road. 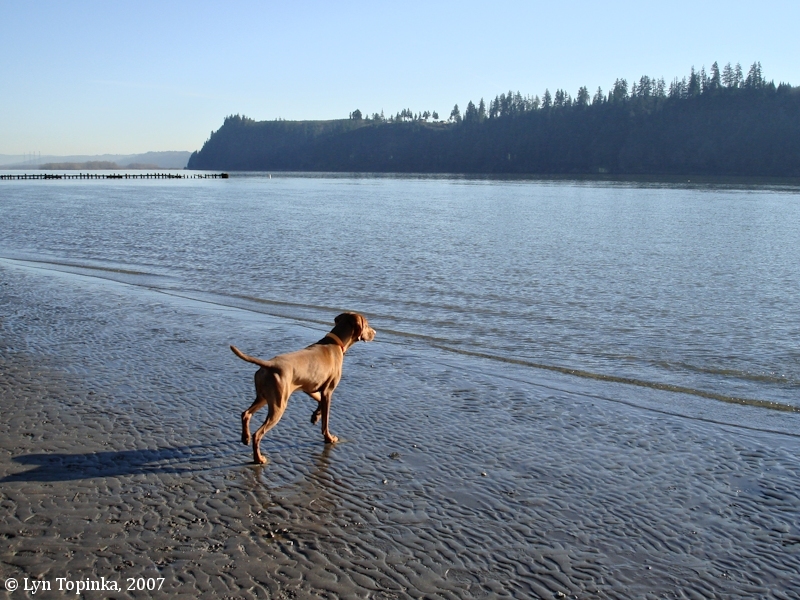 ..."
Click image to enlarge Walker Island and Green Point, Oregon. 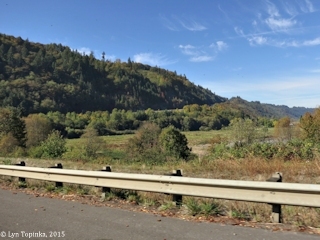 View from Washington State Highway 4, at the mouth of Germany Creek. Mount Hood, Oregon, can just be seen on the horizon. Image taken July 28, 2005. Oregon Highway 30 cimbs from Rainier to Green Point. 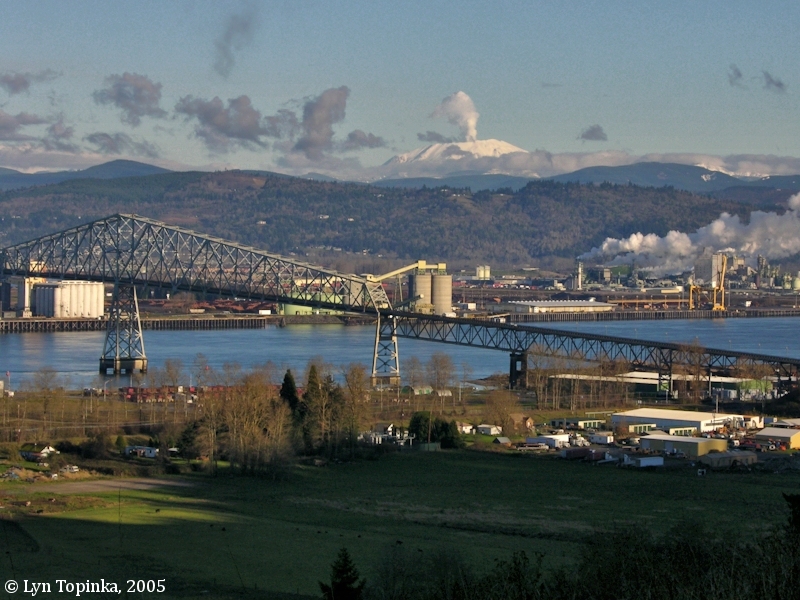 Two viewpoints along the stretch offer fantastic views of Longview, Washington. Click image to enlarge Oregon Highway 30 as it climbs from Rainier up to Green Point. Image taken March 8, 2012. 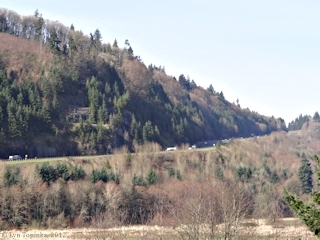 Click image to enlarge Oregon Highway 30 as it climbs from Rainier up to Green Point. Image taken October 5, 2015.